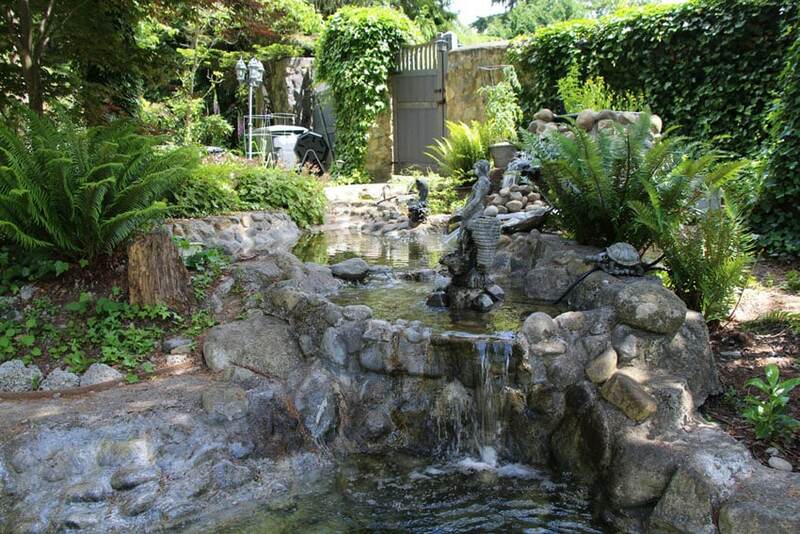 This gallery features beautiful pictures of backyard garden waterfalls with streams and ponds in a variety of designs. 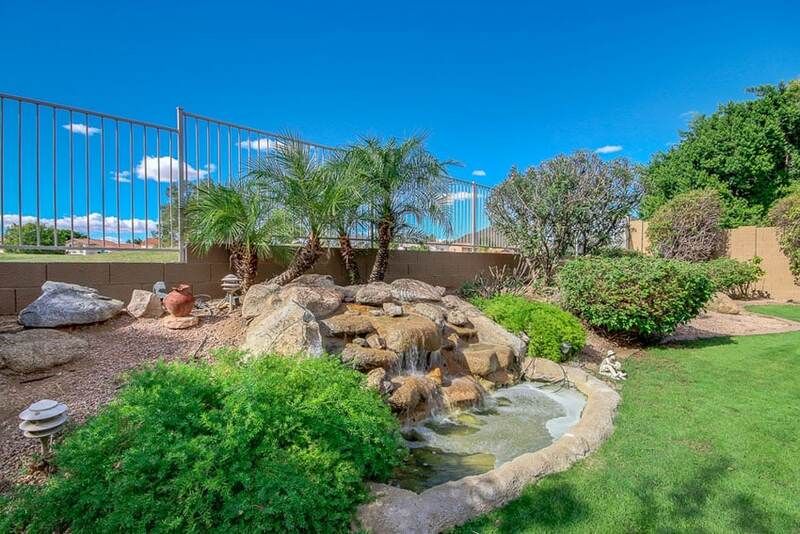 These water features showcase flower gardens, tropical plants and different materials and styles. Below you’ll find ideas and inspiration to create your perfect outdoor living space. 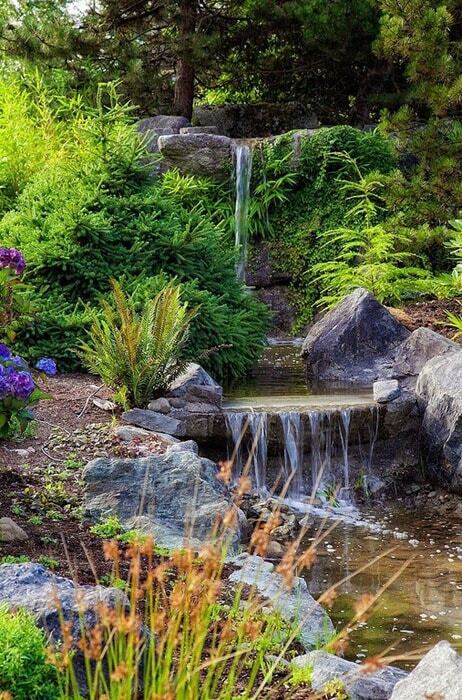 In the image above river stones border this backyard garden waterfall creating a peaceful environment to enjoy. 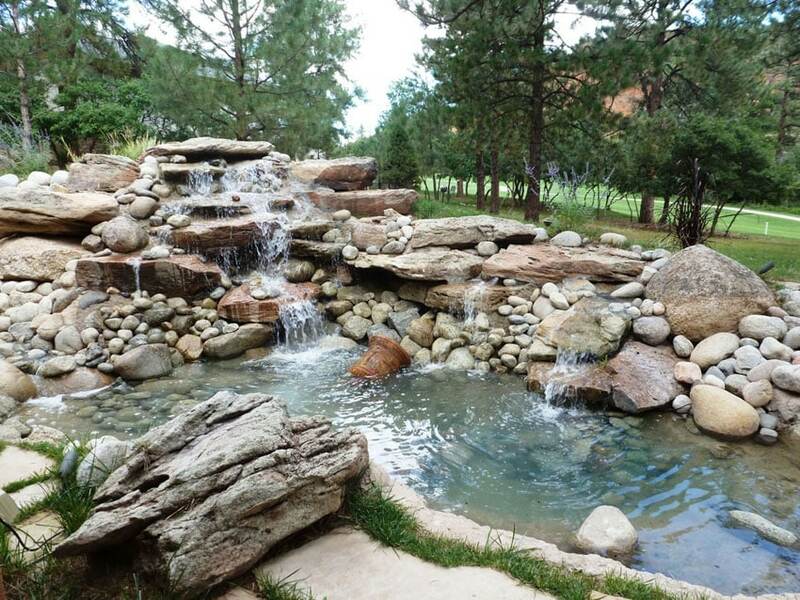 Water flowing through multi-level flag stones into the pond creates a calming, soft and gentle ambient sound. 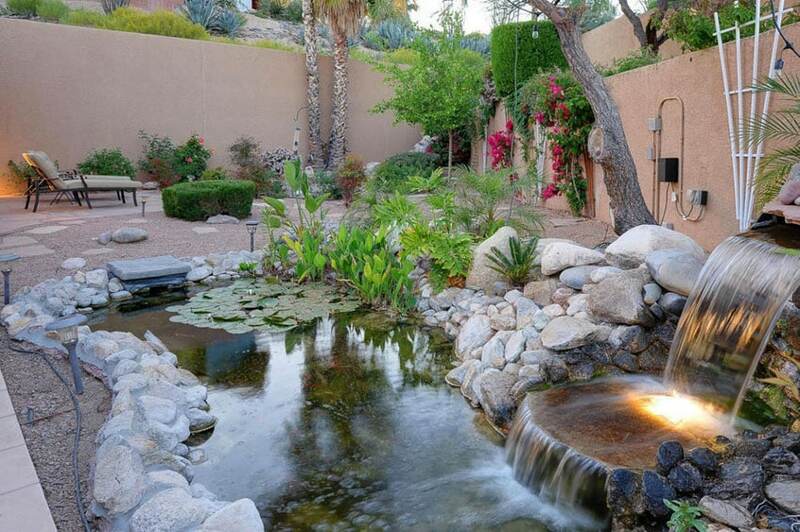 The natural sound and sight of water flowing is soothing and can transform your backyard in to a relaxing oasis. 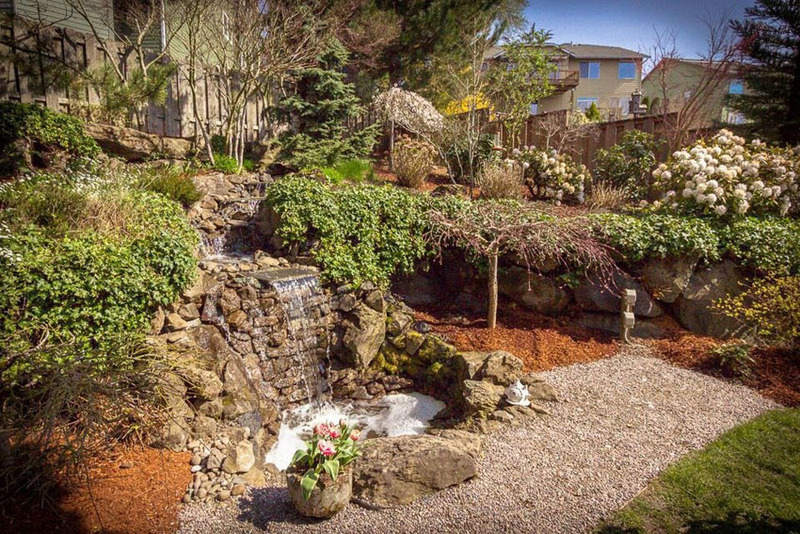 Many backyard garden waterfalls are custom made from home and the results are amazing. 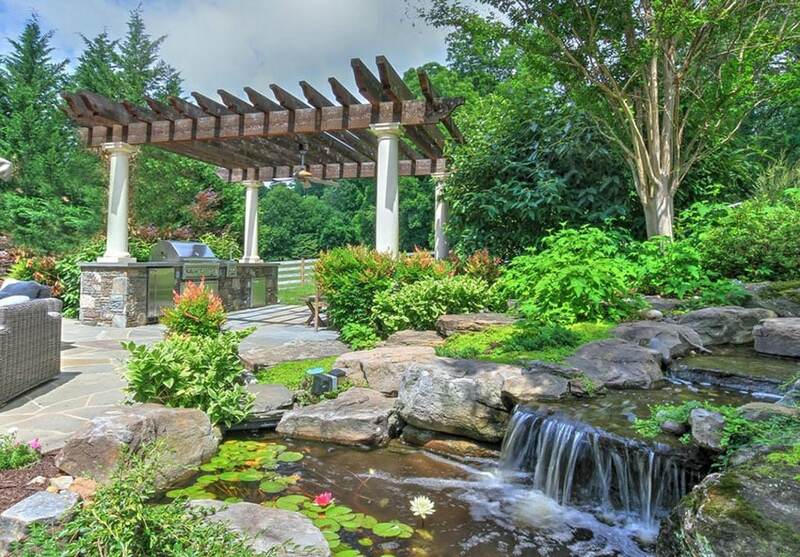 From dramatic waterfalls flowing in to a lagoon like pond to soft trickling waterfalls next to a gazebo, only your creativity is the limit to your design. Rock Waterfalls – Custom rock water features come in many different shapes and sizes and include a variety of types of rock. They can be positioned to circulate water flow from their base back to the top, or collect in a pond before being recirculated. 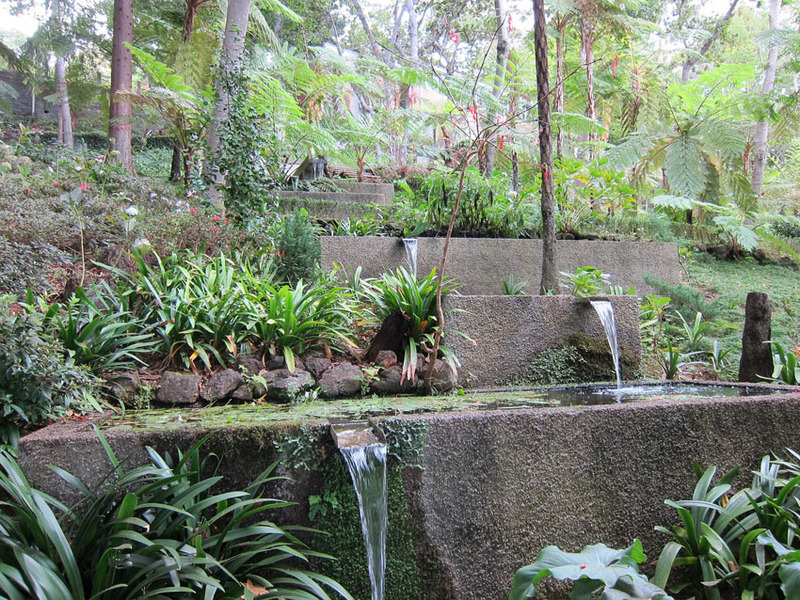 Tiered Waterfalls – Constructed to allow water to flow at different levels. 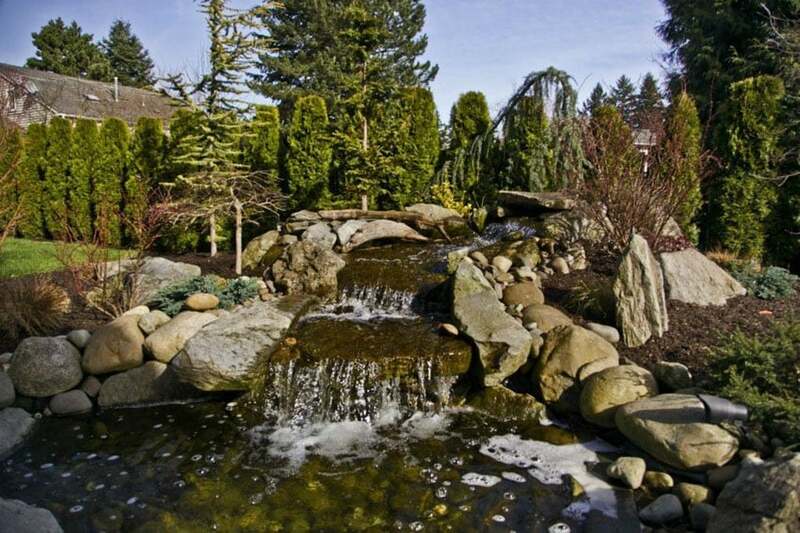 A tiered waterfall can work well with a backyard stream design to create a natural looking environment. Garden Waterfall – With flowering plants that are carefully landscaped around a backyard water feature you an create a beautiful oasis. 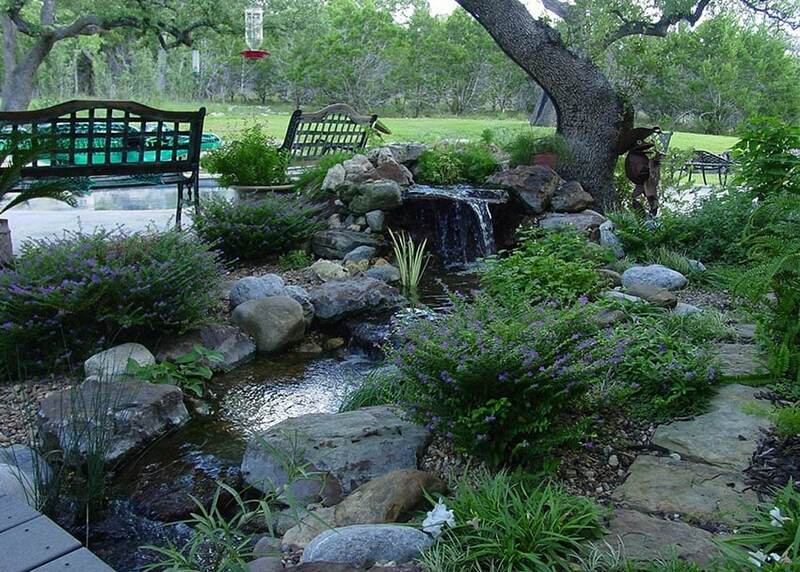 With careful planning a garden water feature can be created to look like a natural landscape. 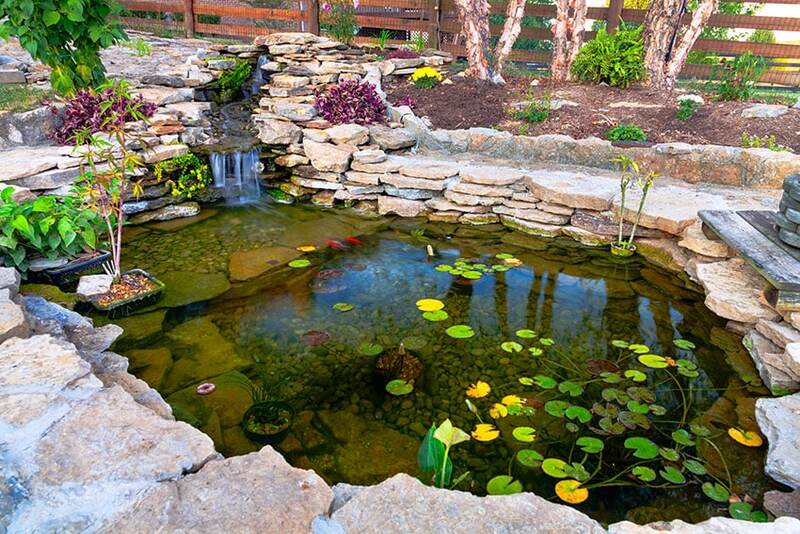 Pond Waterfall – Backyard ponds can be anything from a relaxing place for quiet contemplation to a large sheetfall waterfall. Either way they can be a relaxing place to enjoy the energy of flowing water trickling over rocks. 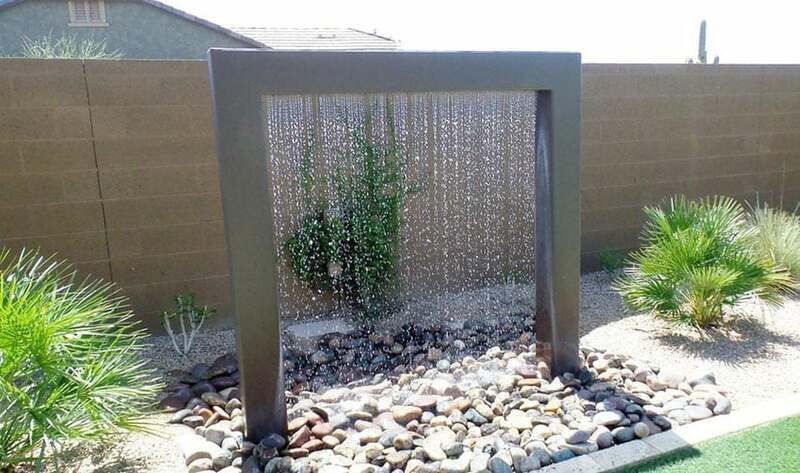 Modern Waterfall – With sleek sophisticated lines modern water features look impressive and can really make a statement in your backyard. 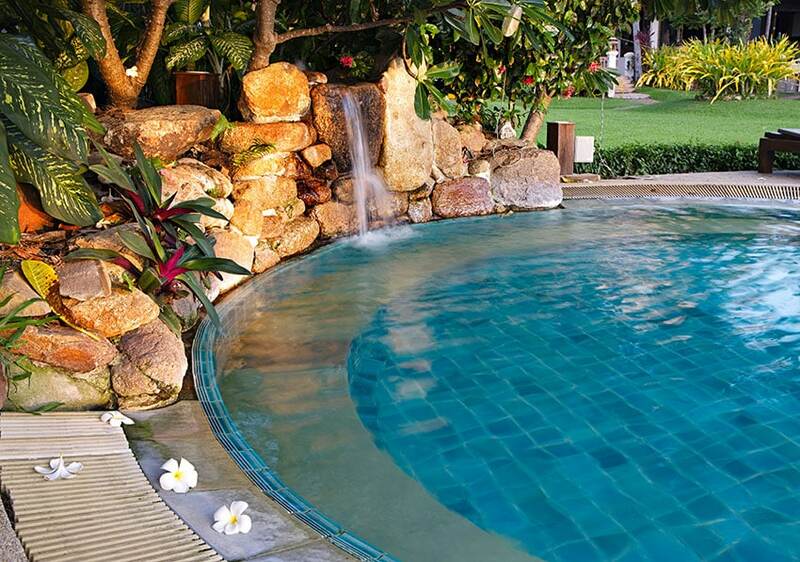 Swimming Pool Waterfall – A water feature in the swimming pool is a great way to add drama and excitement. Kids and adults alike love to swim and play under the flow of water. They can be custom designed or are available to purchase as a kit you construct yourself. Sheet Waterfall – Sheet waterfalls are designed to focus the water in a stunning sheet that cascades down like a work of art. 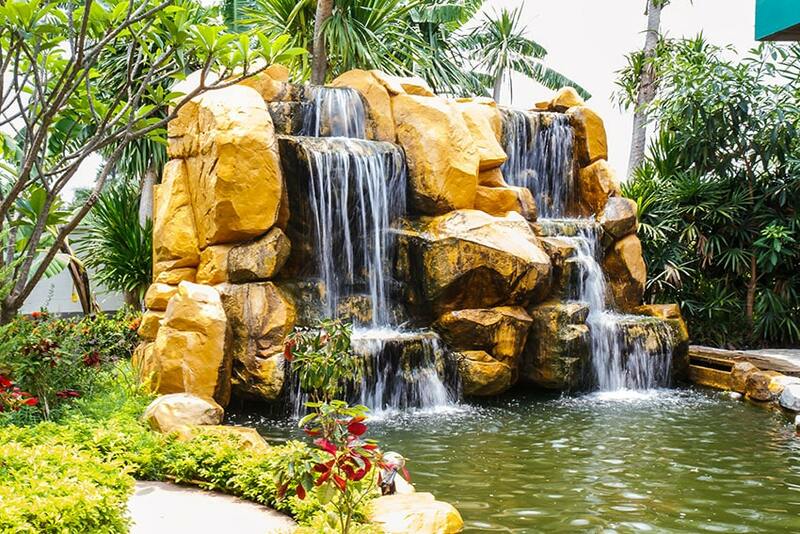 Both mesmerizing and tranquil a sheet waterfall can look impressive and create a peaceful backyard ambiance. 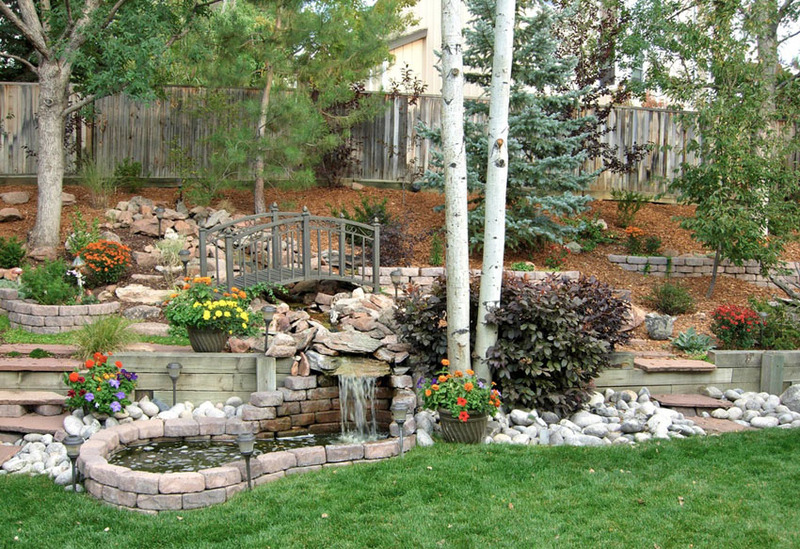 This boulder waterfall spillway creates a more natural appeal to this backyard garden waterfall design. Different sizes and multi-colored river rocks are used to cover the surrounding ground and placed at the bottom of the pond. A backdrop of trees and shrubs near the rock waterfall adds serenity and beauty to the landscape. A grill area under a trellis is great for entertaining and afford a view of the beautiful garden waterfall flowing into a shallow pond. Mix of decorative plants and trees gives this rock waterfall feature a natural and balance setting. This backyard water feature with a small garden pond creates a composed landscape with a relaxing sound of flowing water surrounded by radiant greenery of plants and trees. Fragrant summer flowers and scented foliage in shades of pink, lilac and silver-green hedges contrast the green trees surrounding this backyard garden waterfall. River stones forms the edge of multi cascades water flowing into a pond. 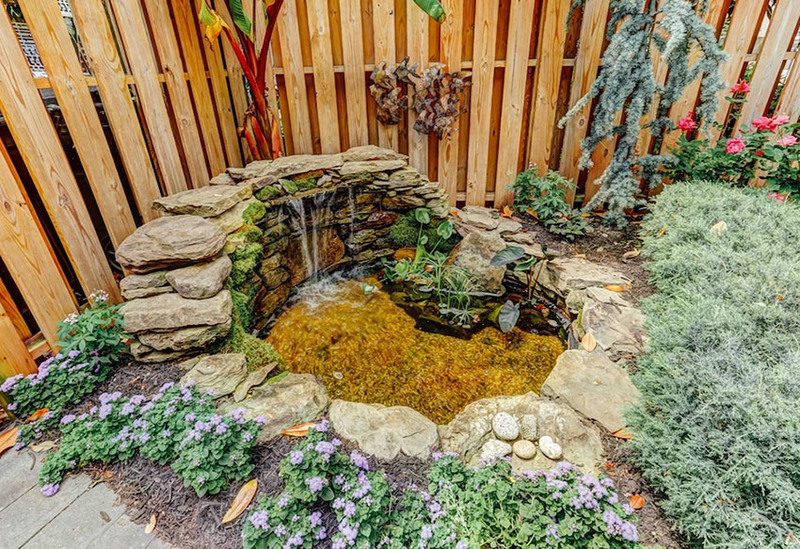 A tiered waterfall feature leading to a stonewall pond surrounded by ferns and shrubs creates a simple and relaxing element to this backyard water garden. The natural stone around the edge of this backyard garden water falls is lined with lilies and green plants; the outdoor lighting creates a serene ambiance. 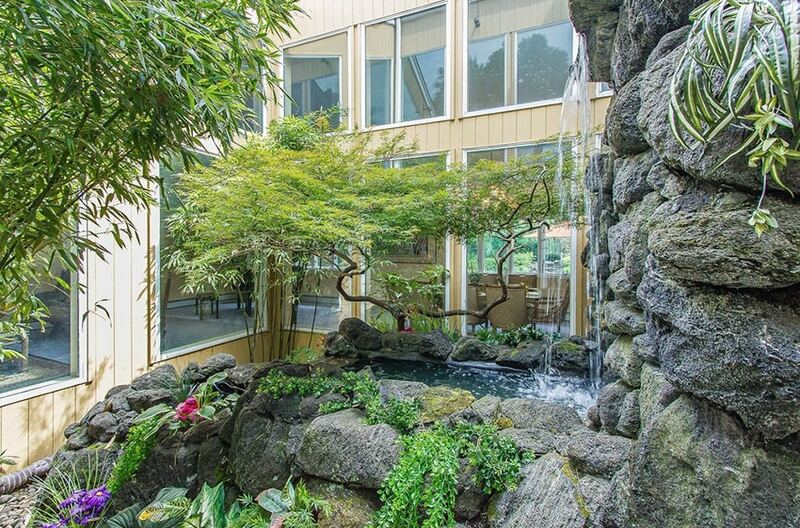 Inspired by a Zen approach, this garden waterfall is characterized by rustic assembled stones, a rock wall behind the falls, bamboo and plants growing in patches. 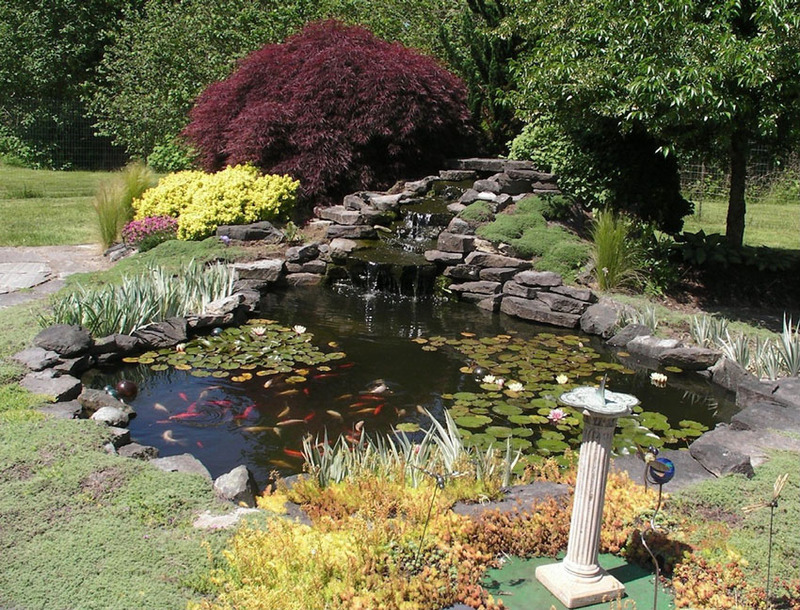 This simple circular garden pond bordered with stone and a small waterfall flanked by flowers shrubs and grasses, creates a focal point for this backyard garden. These waterfalls have multiple drops, outdoor lights and green foliage, perfect stone blocks with large round stepping stones gives this backyard a more natural feel. 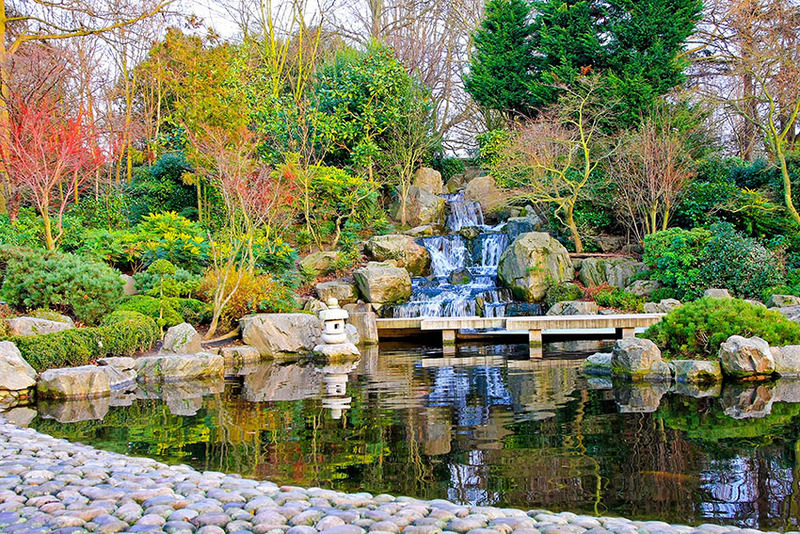 A modern Zen waterfall feature which gently falls and hitting rocks below; creates a calm vibe producing a peaceful approach to a nostalgic garden experience. This tranquil water garden has a pedestal style bird bath as an accent piece, surrounded by trees, tall bushes, water lilies and green luscious grass. 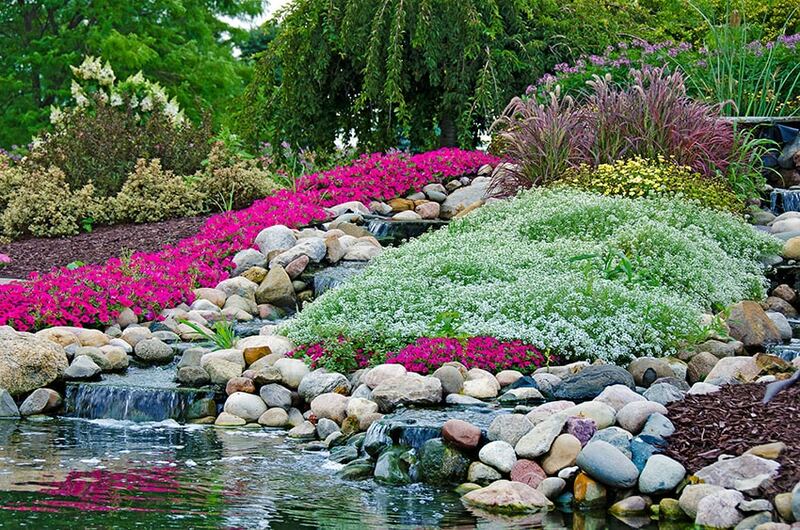 A beautiful hillside water feature built with receding layered natural rocks, high rolling waterfall enfolded with various rock boulders, trees, bushes, colorful flowers and grasses. A perfect private slanted deck spot over-looking an alfresco layered stone waterfall cascading down and giving off a cooling and relaxing feel for this outdoor seating area. Nature finds its way to this exquisite backyard garden waterfall design in the neck of the woods surrounded by paving stones using flagstones. 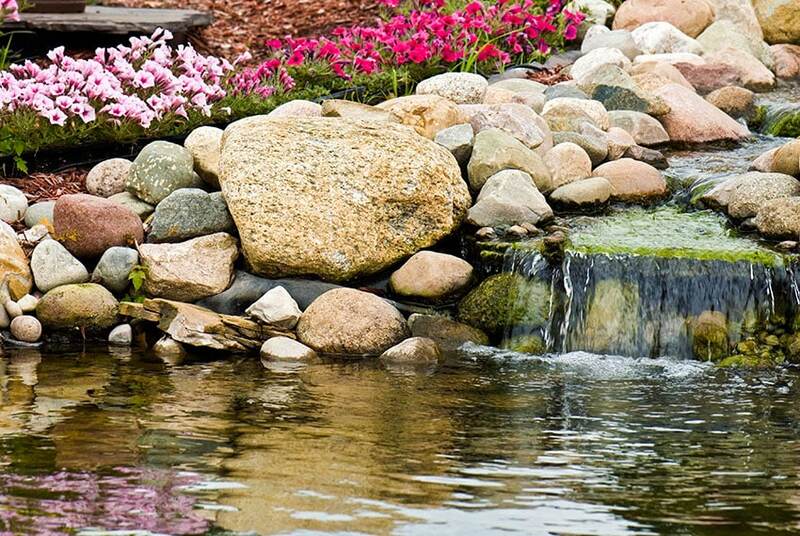 The arrangement of stones makes this water feature look natural and inviting. A stream-like waterfall design, edged by different types of natural stones and tops off with a slab cut stone foot bridge gives this backyard an outdoor sanctuary surrounded by nature’s finest. A garden pond surrounded by large boulders tapers off into a flowing waterfall. A backdrop of ornamental trees adds softness and a bed of moss welcomes a contrast to the toughness and coldness of the stones. Tucked away under a stone pathway is a scaled-down cascading waterfall display flanked with marginal plants. A small decorative frog squats on one of the steppingstone sets up a delightful centerpiece. 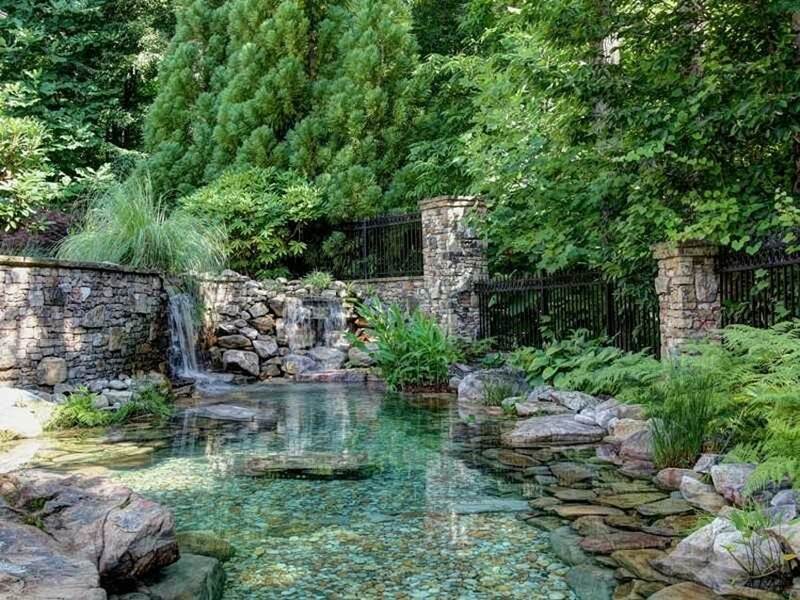 A secluded private backyard garden retreat enclosed by semi-dressed stone with trees and shrubs as backdrop, replicates a crystal clear lagoon with a waterfall design feature. 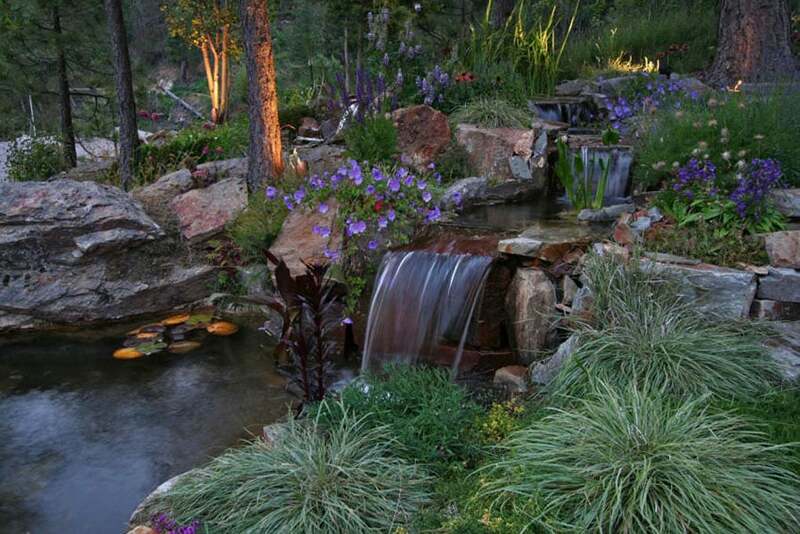 This expansive rustic landscape defines an aesthetic element for a backyard garden waterfall. 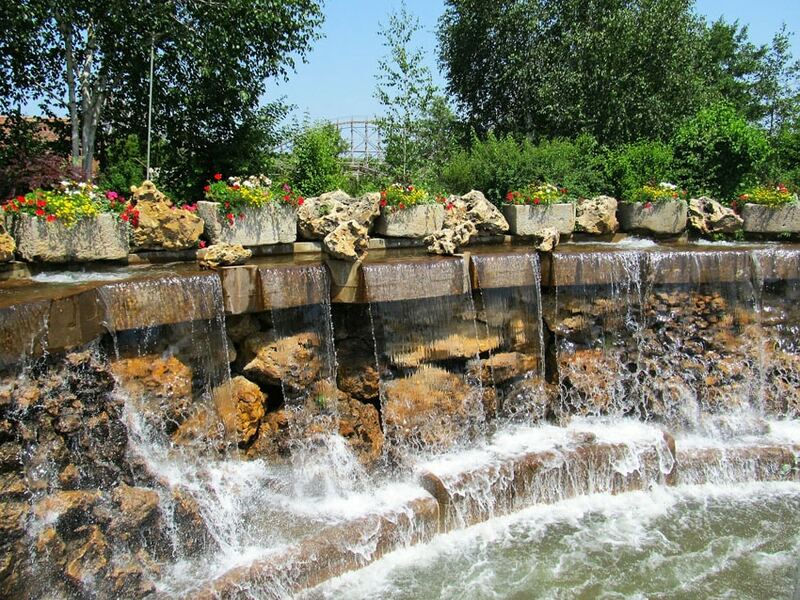 The multi-level waterfalls cascading through massive river stones and field stones designed to achieve a natural look. Enhancing this backyard landscape is a garden waterfall feature using natural stone textures and multi-color blends of these irregular brick-layered field stone and combined it with the lush green grass. 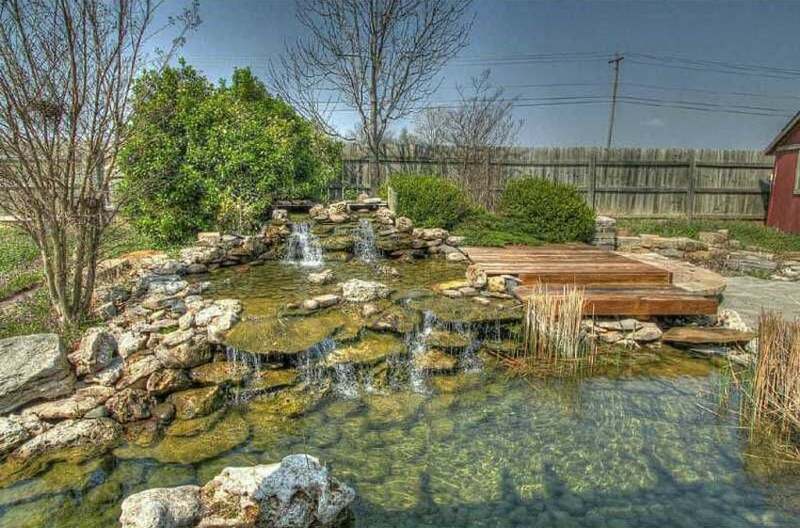 This multi-level overflowing backyard waterfall feature has a wide deck bordering on one side. Moss covered natural stone lined the bottom of both shallow and deeper pond. 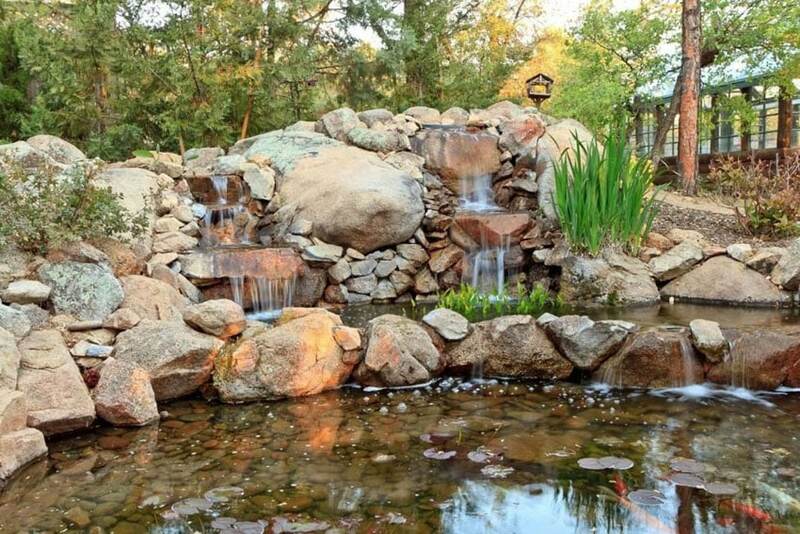 Bounded by massive stone boulders, this outdoor garden oasis has two waterfall features cascading into a beautiful two tier shallow crystal clear fishpond. 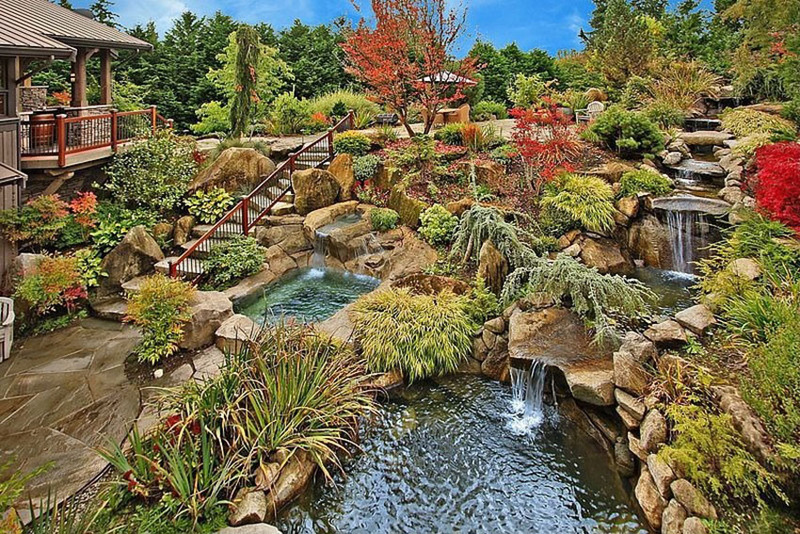 A picture perfect waterfall flowing into a stream-like pond from a higher level water feature edged by large boulders and lush foliage encompass this backyard garden paradise. This backyard garden has a rock waterfall surrounded by large boulders and different types of gravel, adding texture and color. Lush vegetation and shrubs gives this garden a relaxing feel. 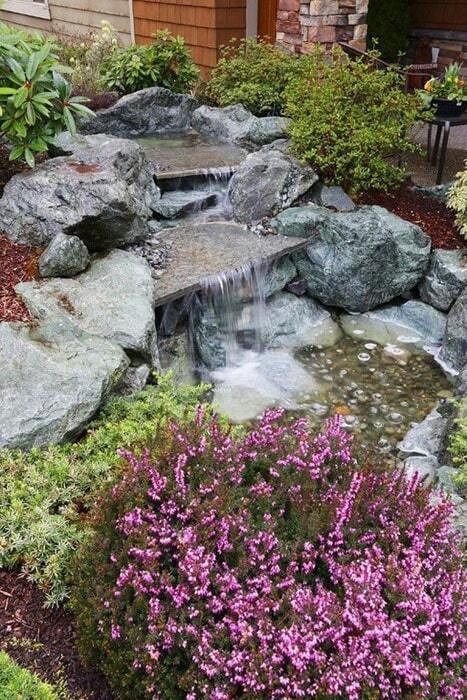 For an elegant touch, this backyard garden waterfall is designed using polished granite slab. Rough textured rocks and boulder lined the spillway and stream creating pockets for plants adding color and beauty to the landscape. 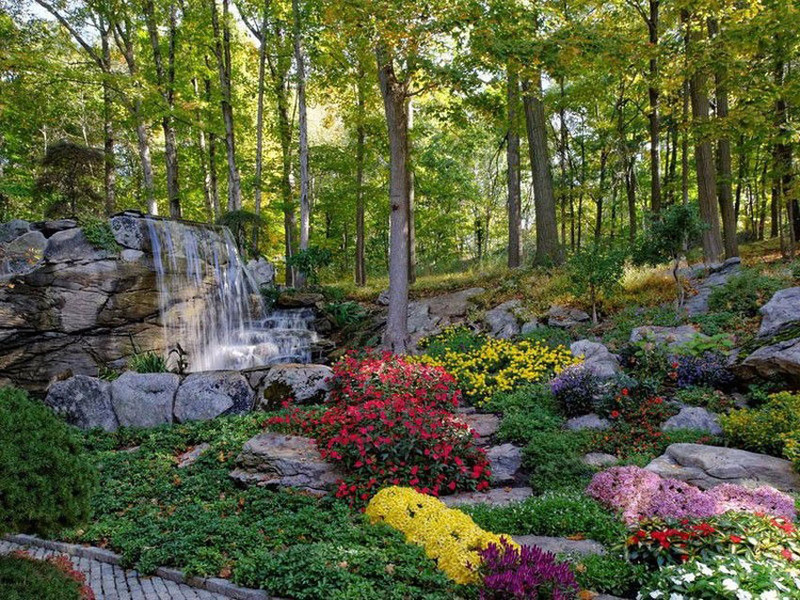 An informal design for a backyard garden waterfall brings a natural look using rocks and boulders surrounded by lush trees, bushes, shrubs and grass enhancing the beauty, color and form of this landscape. 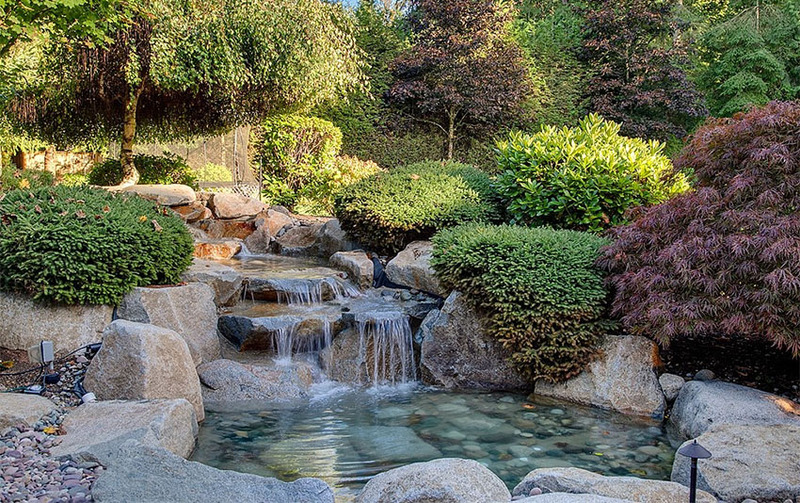 This elegant Japanese inspired backyard garden waterfall has plants surrounding the pond and maple trees which are classic elements for Japanese garden and landscape. Different types and sizes of decorative rocks and boulders enclosed the multi-level waterfall adding texture and form to the theme. 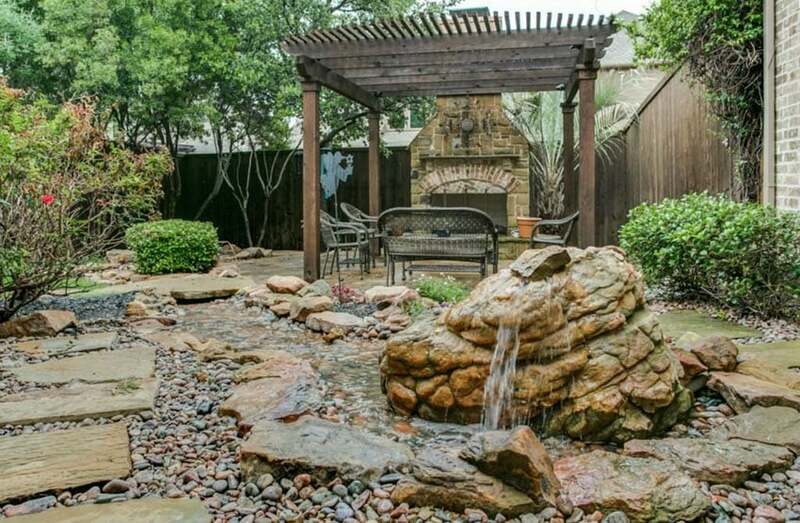 Romance is in the air with this backyard garden waterfall design. The calming sound of water flowing into a stream, decorative landscaping stones, fragrant evergreen shrubs and cast iron garden furniture create an ambiance of a fascinating romantic setting. Many backyard garden waterfalls are courtyard inspired and designed for that much needed recreation and relaxation. In this photo an outdoor fireplace with garden furniture set, provides warmth and plenty of seating under a pergola for shade; perfect for entertaining guests anytime of the day. 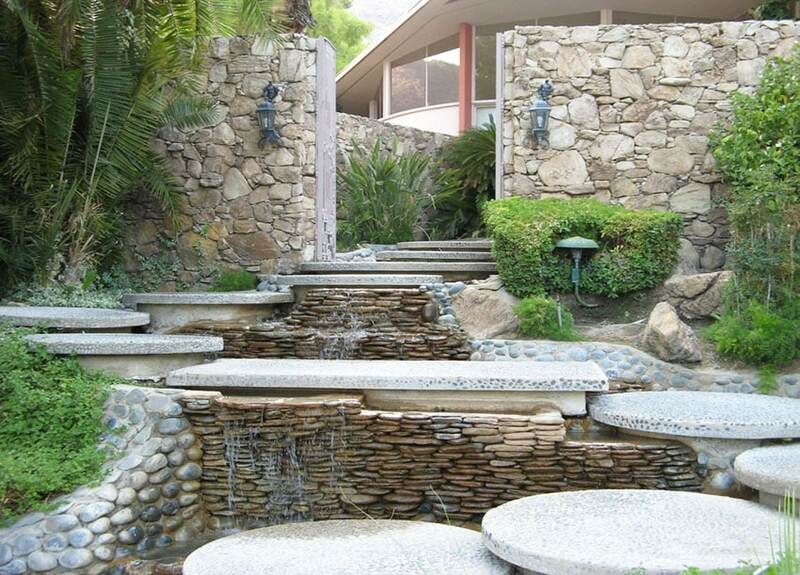 A rock waterfall feature replaces a common fountain. 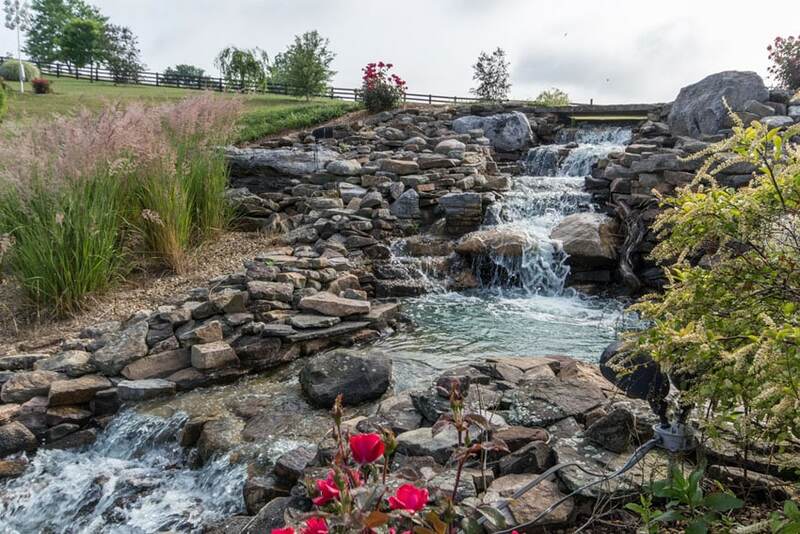 This natural planting arrangement and rock setting with multi-level waterfall flowing into a deep pond, is created to look as nature’s finest backyard garden waterfall landscape. 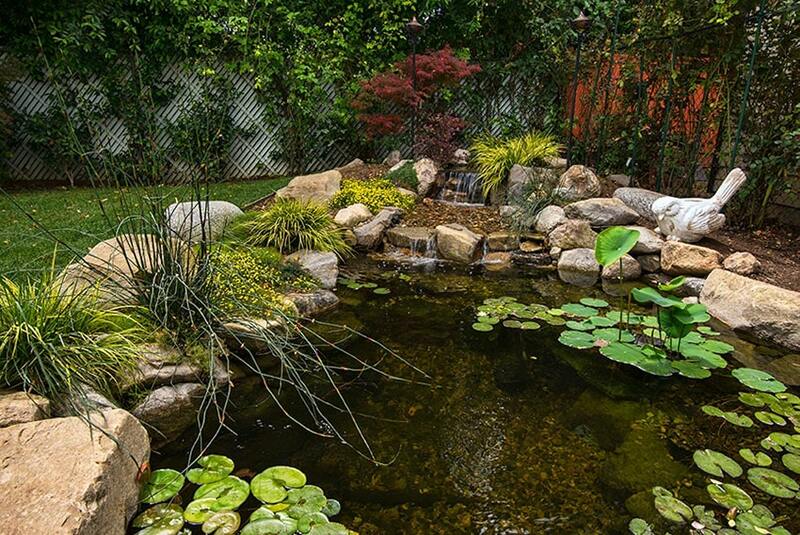 Finding a creative way to add a focal point to this backyard garden is by designing a waterfall feature with a rock lined pond, ornamental grasses, water lilies and yellow floating hearts accented by a perched ceramic bird. 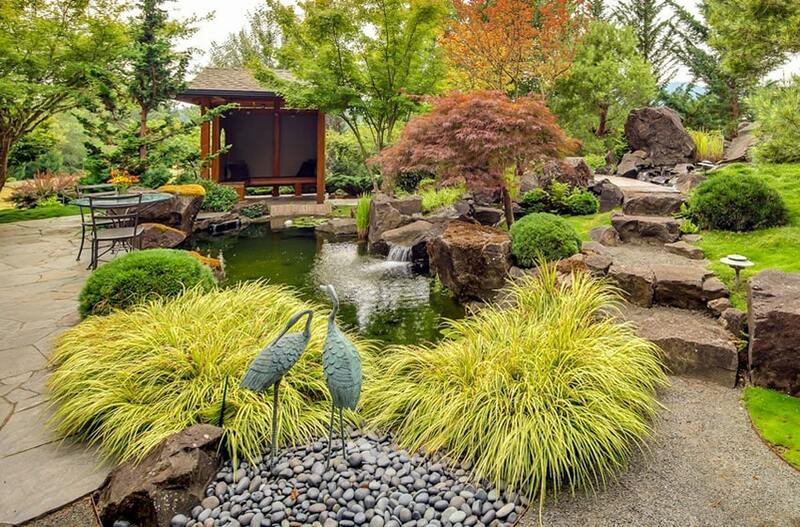 Perfectly nestled in the middle of this garden is a Japanese inspired design. 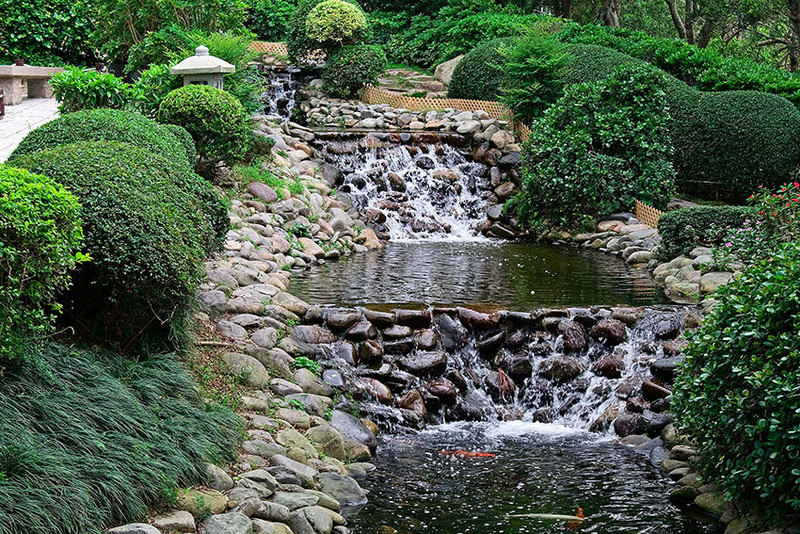 Traditional plants such as evergreens, dwarf varieties of trees and shrubs, and sculptured bird ornaments standing on river rocks are very symbolic elements for this Japanese backyard garden waterfall landscape. Large boulder steppingstone replicates the customary garden bridge leading to a wooden pavilion with a view of the waterfall leading into a pond. 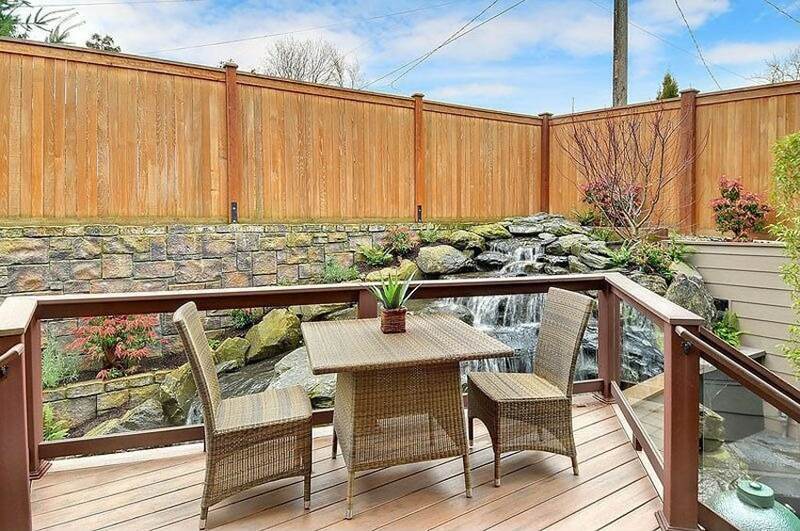 A ledge waterfall gives this backyard garden an eye-catching grand effect for to this outdoor living space. 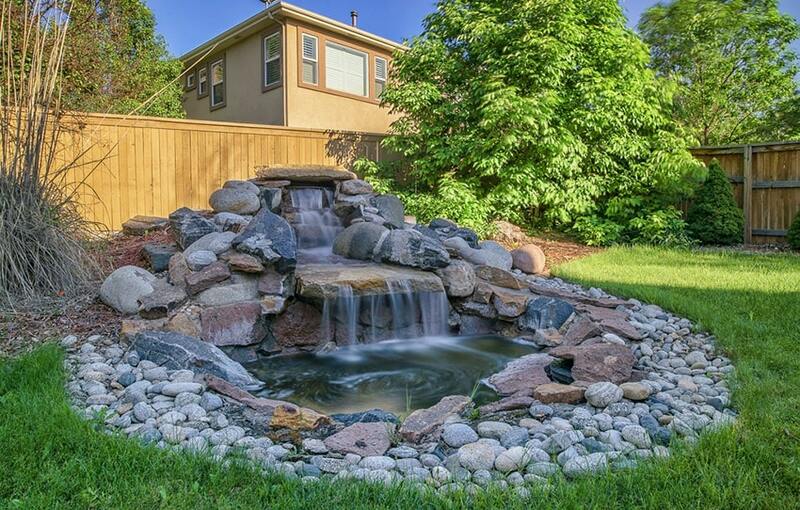 The cascading water flowing through multi-layer massive boulders creates a soothing vitality. Massive rough boulders surround this multiple cascades waterfall. Indulge in the sound of water flowing over the rocks for a soothing cooling effect adding an excellent atmosphere of luxury. 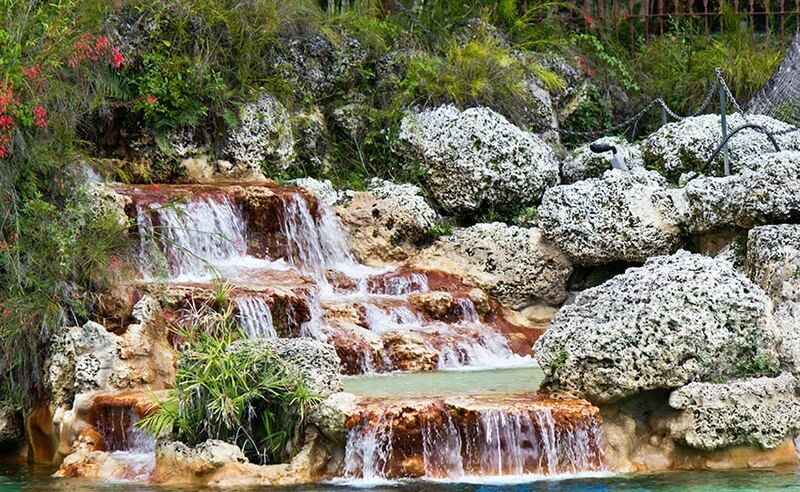 Located in the middle of a pool is an elegant massive rock waterfall feature; adding to this spectacular view are colorful plants on top of the rock formation. Multiple cascade of waterfalls pouring from a pond above into a deeper basin below bounded by rough layered rocks, trees, spiky grasses, bushes and other ornamental plants. 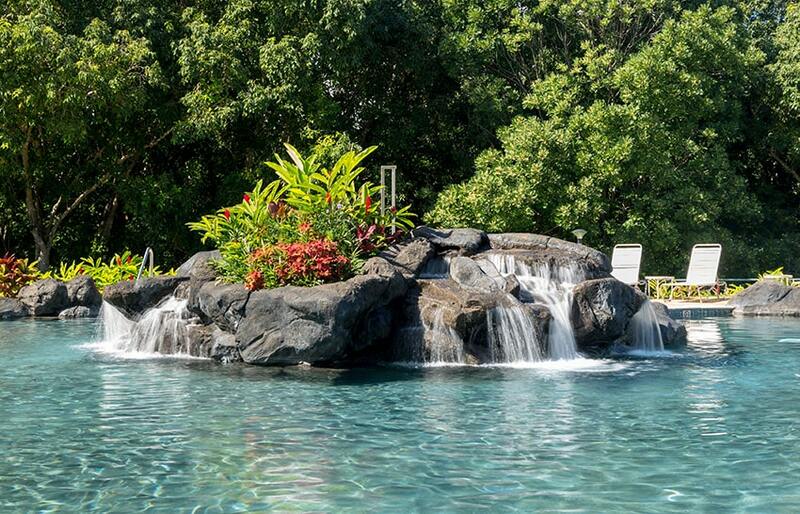 A classic round backyard pool is designed with an extra touch of elegance by adding a waterfall feature using natural rocks and boulders. Tropical plants, flowing trees and trimmed grass add textural contrast to this lovely backyard garden landscape. Water overflowing through river stone rocks into a two-tier fishpond bounded by pruned shrubs revealing architectural form and its bold textures create an interesting elements of a Japanese garden inspired scenery. 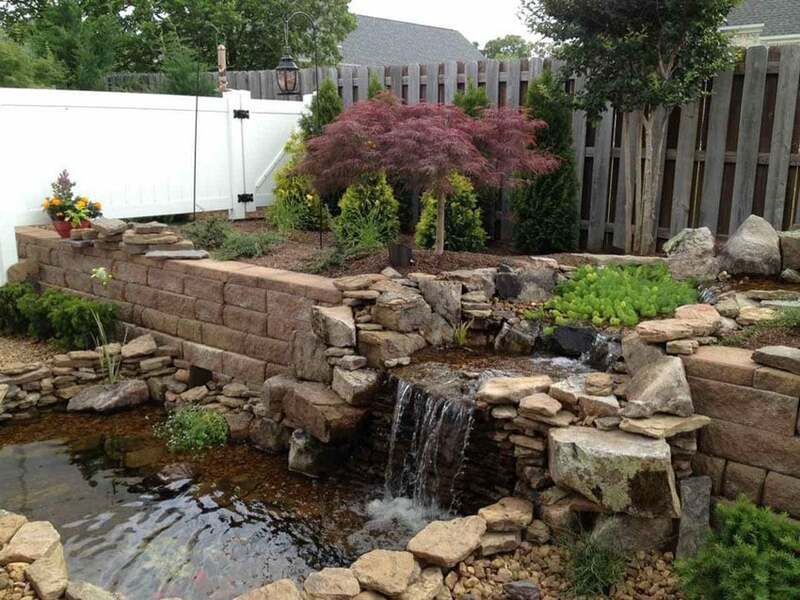 Lined by different types and sizes of rocks and flower beds, this backyard garden waterfall creates a soft and soothing sound and relaxing feeling. Different types of ferns growing around and in pockets in between moss covered natural stone boulders. Lattice trellis and hanging plants adorn above this backyard garden waterfall. Stacked flagstones border this pond while river stones are placed on bedrock. Aquatic plants float on the deep end of the basin and other ornamental plants are placed along the edges. 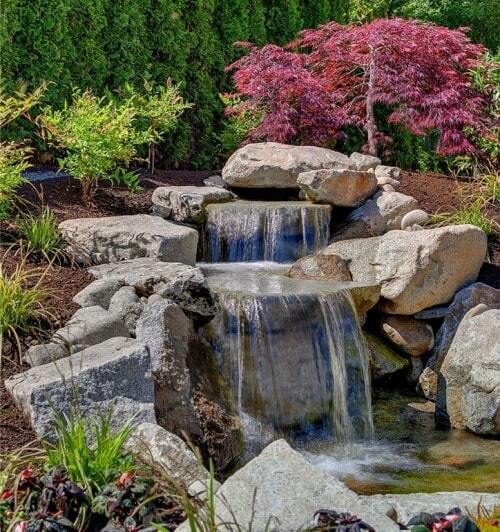 The soft cascade of water adds to the soothing nature of this backyard garden waterfall. Koi fish brings more color and life to this water feature. 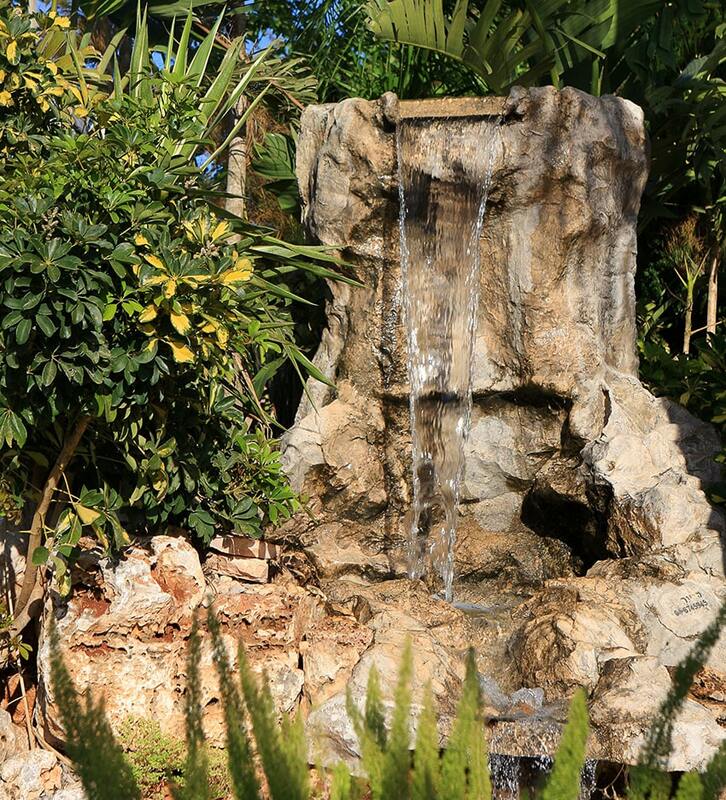 Designed for peaceful contemplation, this backyard garden waterfall provides a spiritual haven for visitors. Fiery Japanese maple offer a colorful contrast and create balance to the green pruned trees and other oriental plants. 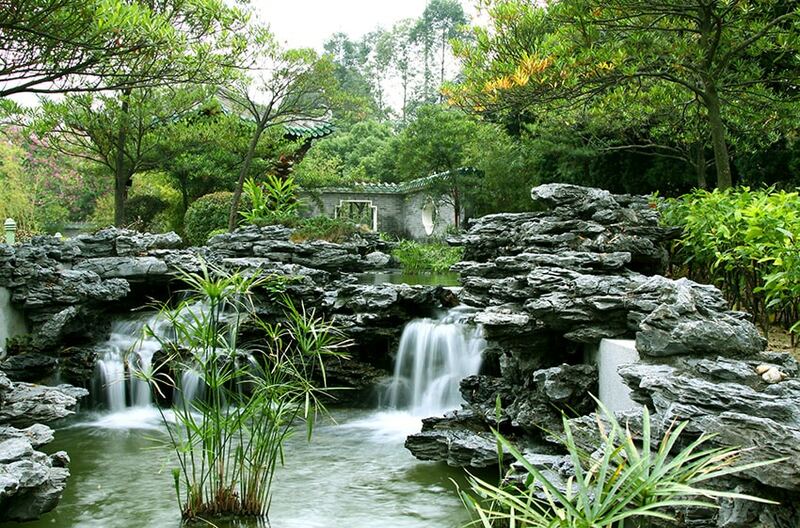 A pagoda stone lantern, multiple cascades waterfall and zigzag bridge create artistic focal points. River stones and natural rock boulders symbolizes strength and endurance. 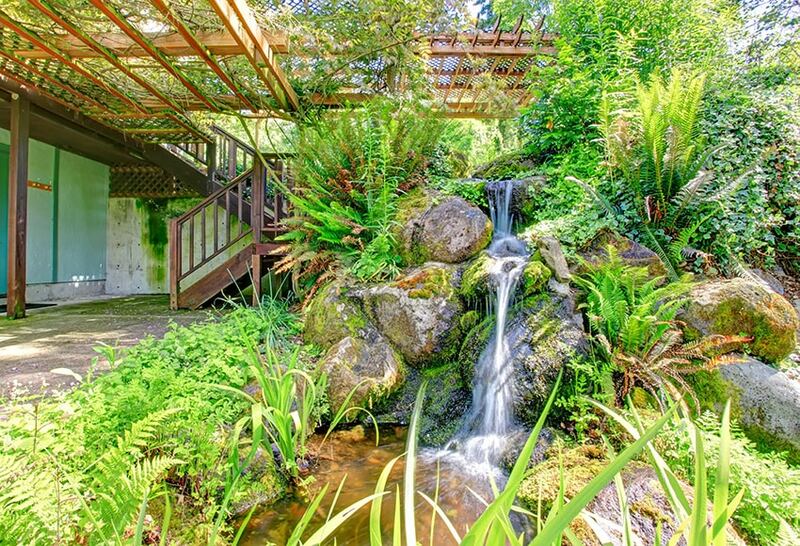 A sheet waterfall pours over this man-made rock waterfall feature surrounded by evergreen shrubs and ferns as part of a mixed hedging gives this backyard garden a natural touch. Tall grasses and other plants flourishing in moist soil surrounding this backyard garden waterfall rock feature is designed for a natural landscape. 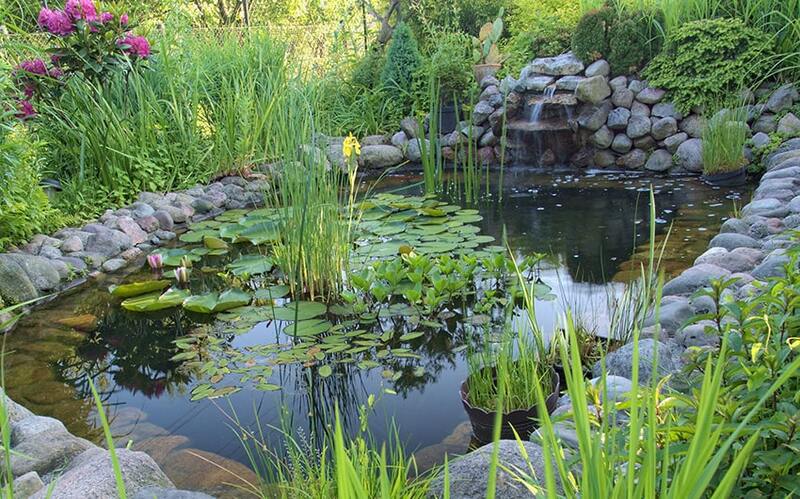 Water lilies and lotus flowers adds interest and color to this waterfall pond. 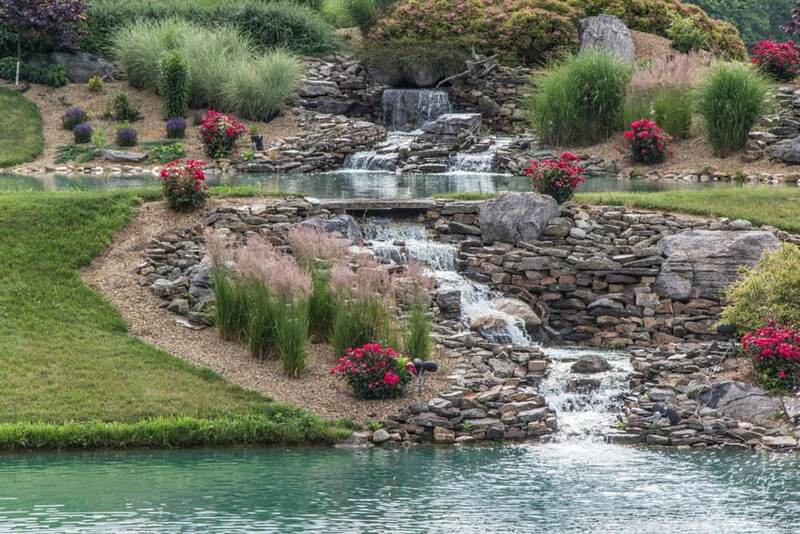 Multiple waterfalls that flows into a two-tier pool surrounded by stacked natural rocks, mixed border of flowering plants, tall grass hedges and lawn create a vast elegant landscape. Layers of rocks border this backyard garden waterfall feature. 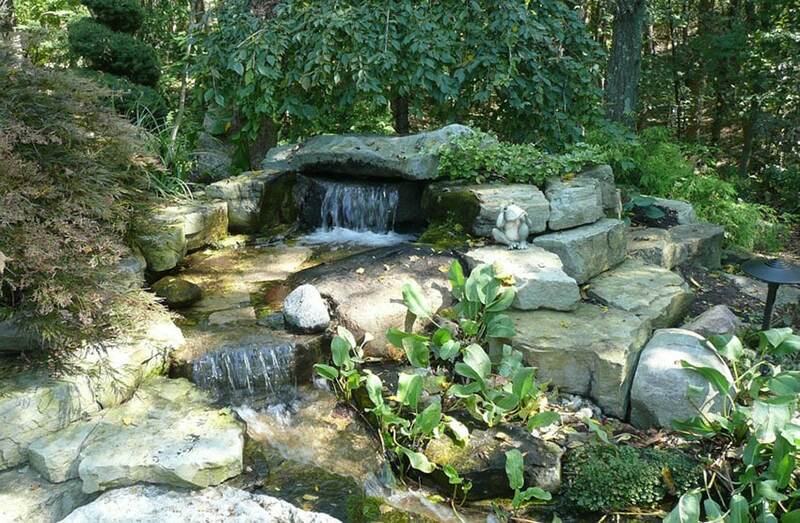 Ferns and natural pond plants provide beauty and balance to this outdoor rock waterfall. Stone ornaments adds appeal and focal point. Arched bridge inspired from Japanese motif is the focal point of this refreshing little backyard garden waterfall design. Potted flowering plants, grass, rocks and wood chips as ground cover enhances this garden landscape. 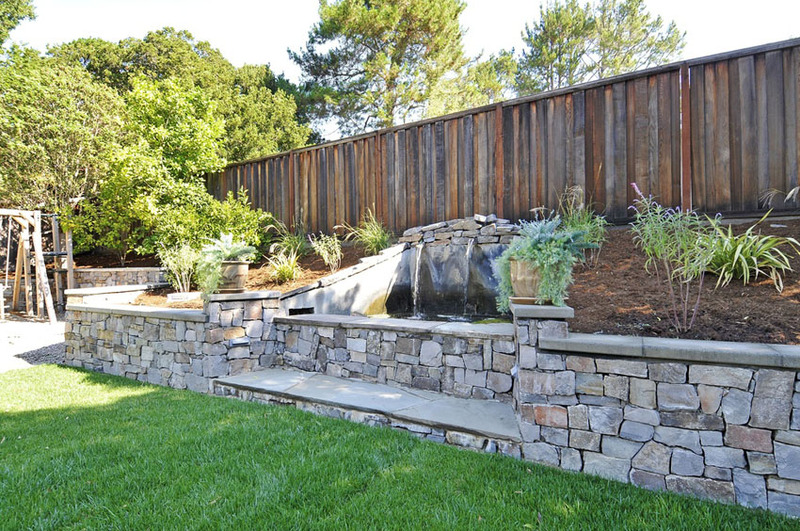 Multiple sheet waterfall overflowing to multi-tier ledge bordered by different types of plants add textural contrast to this backyard garden waterfall landscape design. 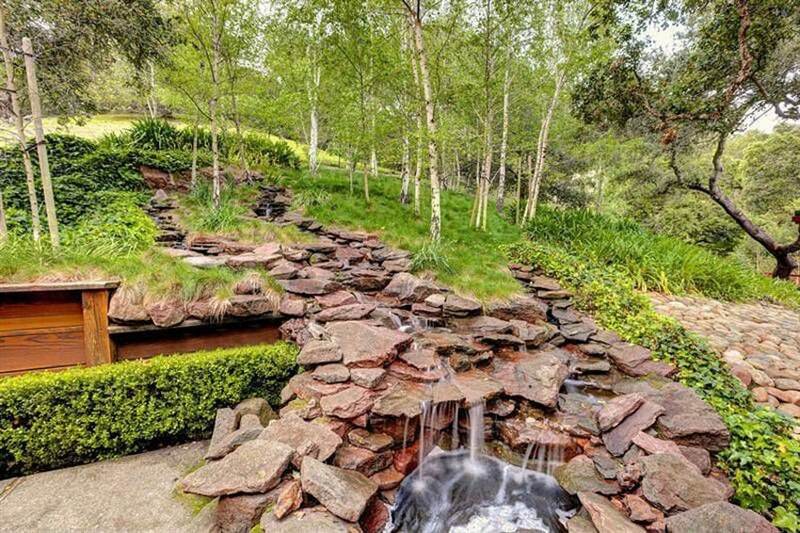 Two-tier waterfall feature bordered by large natural rocks and pours into a moss bedrock pond soothes the senses. Adding a pleasing contrast and color are shade-giving trees and water-loving plants. 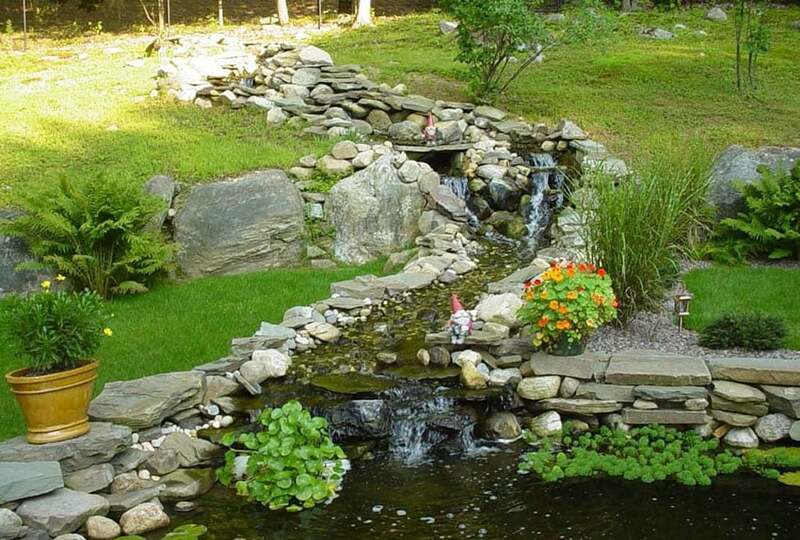 An ornament gnome guards this backyard garden waterfall feature bordered by different types and sizes of rocks and boulders. The grass, ferns, potted flower and aquatic plants softens and adds beauty to the landscape. Multiple sheet waterfall vigorously flowing over rocks into a pool cast mists into the air giving off a cooling effect to this backyard garden waterfall. Flowering plants on sculptured rock face creates drama to this waterfall feature. 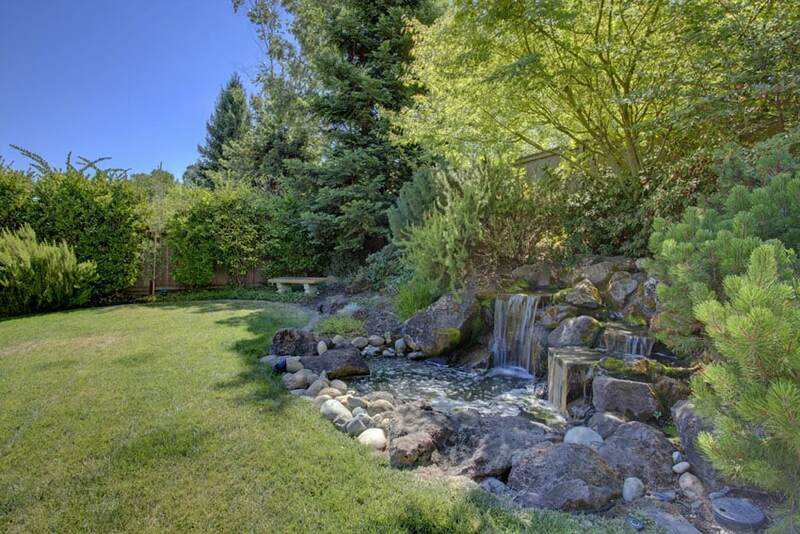 Backyard garden waterfalls should may a big impression. 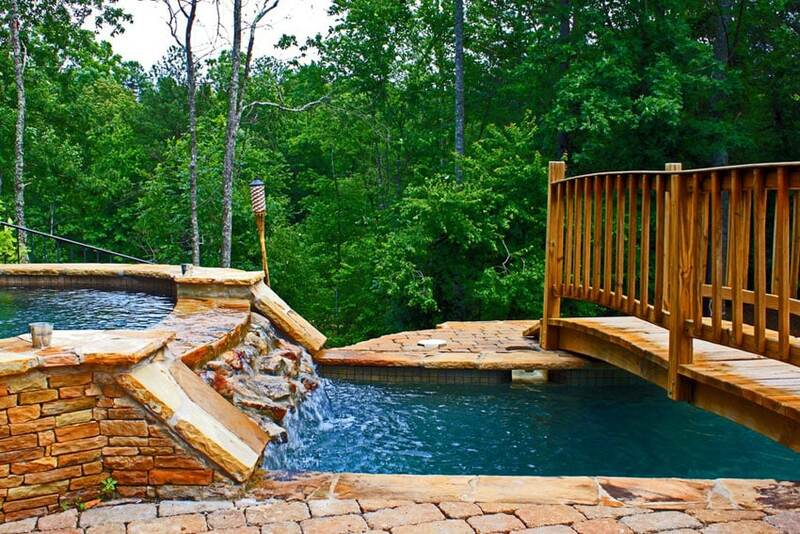 This image showcases a stacked stone waterfall feature designed for a multi-level pool. A wooden bridge over the deeper pool creates an access to the other side into a secluded area of the garden.